The Frozen Matcha Dairy Bar was made to satisfy the flavor, nutrition and functional needs of food and beverage manufacturers and the consumers they formulate for. Read on to learn how it is made, its stand-out qualities and that Undeniably Dairy advantage. What is the Frozen Matcha Dairy Bar? Breakfast on-the-go, nutritious snacking and healthy refueling are all possible with this one unique item. This high-protein, dairy-rich frozen yogurt bar uses matcha powder, skim milk, Greek-style nonfat yogurt, heavy cream and milk protein isolate to give the filling its high-quality protein and appealing flavor. The wafers are created with brown sugar, rolled oats, whole wheat flour, egg whites, canola oil, tapioca starch, baking soda and vanilla extract. This portable and satisfying concept has, in total, 15 grams of protein and embraces popular flavors along with nutritional benefits to interest a range of consumers. The Frozen Matcha Dairy Bar can be eaten at any time throughout the day, but the popularity of on-the-go breakfast offers an opportunity to penetrate a market that shows growth potential for frozen and convenient items. In many regions, consumers want portable and healthier choices to consume away from home - specifically, frozen/refrigerated foods and yogurt, which have increased in sales since 2010.2 So why not combine a frozen breakfast or snack that offers the flavor and health benefits consumers desire today? High-quality protein: Many bars on the market sacrifice protein in order to preserve taste. 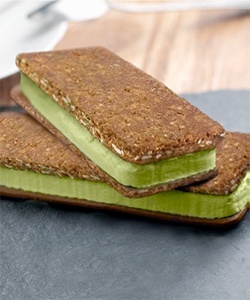 The Frozen Matcha Dairy bar has 15 grams and tastes great, thanks to creamy Greek yogurt. With the demand for high-quality protein, new products continue to incorporate protein-rich ingredients, like Greek yogurt, into frozen applications to help consumers achieve the daily recommended protein intake and protein-led health benefits. Matcha flavor: Matcha is a finely ground powder from a tea plant. Matcha sales grew exponentially over the past 25 years, increasing by 500% in the U.S. to create a $10 billion-dollar industry.3 Regarding production, there were 1,042 new product introductions using matcha globally in 2016.4 The matcha trend has even developed into entire destinations, such as MatchaBar and Cha Matcha in New York City. Now, consumers can take their matcha on-the-go with this prototype. What is the Undeniably Dairy advantage? Undeniably Dairy is the dairy community’s consumer engagement campaign to celebrate the dairy farming story and the resulting enjoyment coming from milk in its many forms. U.S. dairy can help food and beverage manufacturers successfully execute on their creativity. High-quality dairy ingredients and products taste great, they provide protein enhancements and complement, but don’t overpower, the flavors of foods and beverages. Unlike other ingredients, U.S. dairy proteins contain all the essential and non-essential amino acids, including branched chain amino acids, making them one of the highest-quality sources on the market. Beyond flavor and protein, dairy can do wonders for a formulation. Milk protein isolate adds dairy protein, calcium, magnesium and phosphorus to boost nutrition, which may reduce the need for additional fortification. It also offers emulsification, foaming and whipping, heat stability and water-binding characteristics. Greek-style nonfat yogurt delivers nutritional value, flavor and texture. Skim milk contributes to nutrient value with protein and calcium while enhancing viscosity. Lastly, heavy cream provides creamy texture and smooth mouthfeel. To learn more about the Frozen Matcha Dairy Bar and what dairy can do you for you, download the formula sheet or visit USDEC at IFT 2017, Booth 2270, for more information. Check back next week to learn about the Dairy Protein Cherry Switchel. For more information about IFT17, please visit ThinkUSAdairy.org. 1Americans Are Increasingly Obsessed With Breakfast. Eater website. www.eater.com. Accessed May 11, 2017. 2Why Americans are Eating Less Cold Cereal for Breakfast. LA Times website. www.latimes.com. Accessed May 11, 2017. 3“Glocal” Driving Dairy Flavor Trends. Food Business News website. www.foodbusinessnews.net Accessed May 11, 2017. 4North American Snack Market Sweet on Matcha at Fancy Food Show. NOSH website. www.projectnosh.com. Accessed May 11, 2017. 5Top Food and Beverage Trends Incorporating Greek Yogurt. Grande Custom Ingredients Group website. www.grandecig.com. Accessed May 11, 2017.